TUESDAY OCT. 9 (Valhalla, NY) – Franco Ladron De Guevarra (White Plains, NY/White Plains HS) enjoyed his best game of the 2018 season, registering five points after two goals and an assist. Guilherme Griza (Novo Hamburgo-RS (Brazil)/Colegio Marista Pio XII) recorded his third shutout of the 2018 season as the Westchester Community College Men’s Soccer team downed visiting SUNY Rockland, 3-0 on Tuesday afternoon at Barrett Field. With the win, the Vikings improve to 7-3-1 overall, 5-3-1 in Region XV play, and 2-0 in the Mid-Hudson Conference. Prior to the game, De Guevarra, Mathew Rios (Yorktown, NY/Yorktown HS), Miguel Perez (Montrose, NY/Hendrick Hudson HS), Giovanni Gibaja (White Plains, NY/White Plains HS), Chris Vallejo (Pleasantville, NY/Pleasantville HS), and Bryan Terrones (New Rochelle, NY/New Rochelle HS) were honored on ‘Sophomore Day. After missing numerous early opportunities, WCC finally broke through at 33:50 when Ladron De Guevarra ran down the right alley, and found Lucas Rodrigues (White Plains, NY/White Plains HS) with a perfect crossing pass that Rodrigues fired to the back of the net for a 1-0 lead. The 1-0 score held until halftime despite a 13-4 edge in shots, and commanding edge in time-of-possession. Westchester’s possession edge finally wore the Hawks down after halftime as Ladron De Guevarra scored in transition off an Anthony Aguirre (Sleepy Hollow, NY/Sleepy Hollow HS) assist at 55:08 to make it 2-0, and then scored after an incredible individual effort six minutes later for the 3-0 final. SATURDAY OCTOBER 13 (Kingston, NY) – Freshman Luis Galeano (Mamaroneck, NY/Rye Neck HS) scored his 10th goal of the season during a three-point night. Freshman Jose Montes (Pleasantville, NY/Jose Chocano- Peru) recorded the first goal of his career as the Westchester Community College Men’s Soccer team downed Ulster Community College 2-0 on Saturday evening at DIetz Stadium in Kingston, NY. With their second consecutive win, the Vikings improve to 8-3-1 overall, and 2-0 in Mid-Hudson Conference play. While Galeano’s heroics grabbed the headline, it was the stellar Westchester CC defense that was the story of the day as freshman Guilherme Griza (Novo Hamburgo-RS (Brazil/Colegio Maresta Pio XII) recorded his second consecutive shutout, and fourth during the 2018 season, after a six-save effort. Westchester Community College, who has only allowed more than two goals in a game twice this season, was also led defensively by Leonardo Vargas (New Rochelle, NY/New Rochelle HS), who enjoyed another outstanding game. WCC scored the only goal of the first half on a corner kick as Galeano’s pass found Montes, who headed the ball into the back of the net at 36:07 to break a tense opening half hour of play. The scored remained that way until the final minute of play, when Jose Tovar (Yonkers, NY/Riverside HS) fed Galeano, who dribbled and then fired a ball to the back of the net to make it the 2-0 final. Overall, Westchester out-shot Ulster 19-6, and had seven corner kicks, while the Senators had two. Each team whistled for 11 fouls. SATURDAY OCT 13 (Garden City, NY) – The Westchester Community College Women’s Volleyball team lost a pair of Region XV matches on Saturday, Oct. 13, falling 3-1 to Suffolk Community College and 3-0 to Nassau Community College. The tri-match took place at Nassau CC. Suffolk and Westchester split the opening two sets with the Sharks winning 25-19, followed by a 27-25 win for the Vikings. Suffolk then won the last two sets, 25-16 and 25-16 to earn the victory. For Westchester, sophomore Madison Young (Hartsdale, NY/Woodlands HS) enjoyed a terrific outing with 14 kills, three service aces, and a .611 attack percentage, while Alysha Owens (Mount Vernon, NY/Mount Vernon HS) added six kills, and Melody Pabon (Bronx, NY/Celia Cruz) had a season-high 10 digs, to go with four kills. Nassau CC swept the match 25-10, 25-15, and 25-14. Sophomore Lindsay Leggio (Mahopac, NY/Mahopac HS) led the Vikings with 12 assists, while Taylor Mello (Cortlandt Manor, NY/Putnam Valley HS) had six digs. SATURDAY OCTOBER 13 Haley Duggan (Pleasantville HS) finished 175th at the St Joseph’s Invitational on Long Island Duggan recorded a time of 30:23.8 women’s race at Sunken Meadows in Kings Park NY. The Viking Men’s Team finished 27th. 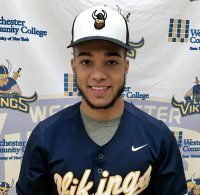 Randy Culcay (Ossining HS) finished 113th for Westchester to lead the Viklings. Culcay recorded a time of 32:54.5. The 2018 Westchester Community College Sports Hall of Fame Class of 2018 will be inducted on Friday, Nov. 16 2018. The event will take place at Juliano’s Restaurant in New Rochelle, New York. The 2018 event will mark the 12th time the Westchester CC Athletic Department has inducted a Hall of Fame class. Nils Strandskov – one of the finest wrestlers in the history of the storied Westchester Community College Wrestling program. Phil Caruso – A member of the inaugural Westchester Community College Baseball team; currently Head Baseball Coach at Fairmont State University. Denise M. Jones – An All-American Softball player at All-American at Westchester Community College. Eugene ‘Buzz’ Keefe Award – Don Weigand – Westchester Community College Sports Hall of Fame Inductee (2011). Lifetime Achievement Award – Anthony Mezzatesta – Former Westchester Community College Athletic Administrator, Head Coach, and Sports Hall of Fame inductee (2006). Tickets for the Sports Hall of Fame Induction are $50 or $500 for a table of 10. For on-line registration, please click here. Kindly RSVP by Nov. 5. For more information or if you have any questions, please contact Mike Belfiore at 914-606-7895 or michael.belfiore@sunywcc.edu.